I have to tell you a secret: I love The Bachelor franchise. Even though the whole premise of the show goes against everything I stand for and believe in, I’m a sucker for the cheesy limo entrances, extravagant dates, and rushed engagements. I especially love the show’s spinoff, Bachelor in Paradise, where a bunch of boozed-up Bachelor/ette rejects hang out on a beautiful beach in Mexico for a few weeks to take another stab at finding love. It’s all of the messiness and drama of the Bachelor/ette multiplied by a hundred. It’s more honest, more raw, and more believable. But watching it this past week, I was brought face-to-face with one of my biggest fears: the one I love leaving me for someone else. I’ve been in a relationship for over two and a half years, and this is something that I still fear. I’m so in love with my boyfriend and can’t picture my future without him, but what happens if he suddenly meets someone prettier and more interesting than me, someone who drives a wedge between us and ultimately causes him to leave me? Relationship anxiety is a very real thing, one that I experience in spurts. Some days I feel great, other days I wonder when my boyfriend will realize he can do better than me. It’s hard to talk about relationship anxiety, because I trust my boyfriend with every fiber in my being, and I’m incredibly happy in my relationship. But my insecurity, coupled with clinically-diagnosed depression and anxiety send me into spirals of “what ifs?” every now and then. Determine your triggers. Are there any particular days/times when you feel especially insecure? Does your partner (unknowingly) say or do things that contribute to your insecurity and anxiety? I know that I get extra insecure, especially about my appearance, around *~that*~ time of the month, so I make sure to give my boyfriend a heads up so he’s not surprised when I get extra emotional or teary over something that seems silly. Find a “person.” Who is the Cristina Yang to your Meredith Grey? I can’t stress how important it is to have someone to talk to when you’re feeling especially anxious or insecure. Voicing your concerns to a supportive, neutral third party who won’t make you feel embarrassed or ashamed for your whacky emotions is crucial to overcoming relationship anxiety. Your person can reassure you that everything is and will be okay, keeping you calm and sane. Don’t click that link. 10 Signs He’s Cheating On You. I Was in a Relationship for Six Years and Found Out My Boyfriend was Cheating on Me: Here’s My Story. New Study Shows X Percent of Couples Have Dealt with Infidelity. With the internet, we’re bombarded with an onslaught of articles, statuses, and stories every day. It can be tempting to read those articles about cheating, but trust me, nothing good will come of it. You’ll be hit with a tsunami of paranoia, obsessing over your partner’s behavior and constantly looking for signs that they may not be faithful. Reading these types of stories just leaves you feeling drained and exhausted, and it’s so not worth the stress. Take a love language quiz with your partner. There are five ways to give and receive love: words of affirmation, physical touch, quality time, giving gifts, and acts of service. It’s important to know how you and your partner express love so that you can better communicate your emotions to one another. One of my insecurities was feeling like my boyfriend didn’t verbally express to me how much he loves me. I decided to have us take a quiz to see what love languages we spoke, and the results were pretty interesting. My top two were words of affirmation and physical touch; these happen to be my boyfriend’s lowest two. His top love language was gift-giving, which was my lowest. The quiz helped me understand why he doesn’t verbally communicate how he feels about me: because he doesn’t think he needs to. That’s not how he wants to receive love, so why would he think to give it that way? Since discovering our results, I make more of an effort to give him gifts (they don’t have to be anything fancy—even something as simple as grabbing his favorite candy bar when I’m out running errands), and he tries harder to express his love verbally. Be honest with your partner in explaining your anxieties. I let my boyfriend know pretty early on (about 3 months) into our relationship that I live with depression and anxiety, and that I take medication for it. I knew that these conditions would play a huge role in our relationship, so I wanted to be as upfront as possible that this is something he would need to deal with—and he’s been wonderful. He’s great at reassuring me about our relationship, calming me down if I’m having a panic attack, and understanding what I need if I’m having a bad day. I think the honesty I displayed at the beginning of the relationship helped him better understand me as a person and the potential insecurities i may have in our relationship. Obviously, if you’re feeling so insecure in your relationship that it’s causing physically or emotionally harmful arguments, or that you feel the whole relationship is ending, it may be best to visit a couples counselor to sort things out. But for those of us in agreeable, committed relationships who have trouble easing their doubts sometimes, these tips can help bring peace of mind. 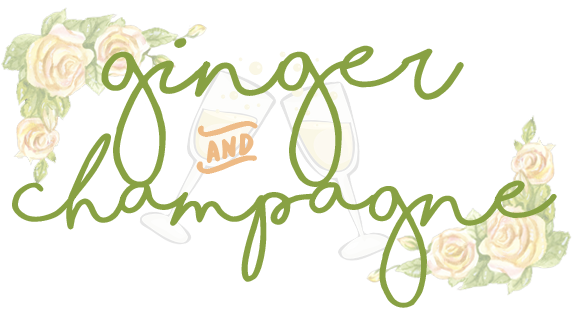 Previous Welcome to Ginger and Champagne!